Finally, I had found the financing for my first feature, SHRIEK. 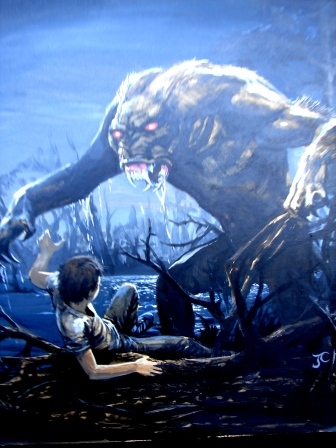 We started hiring a crew, casting the picture, and focused on creating the all-important creature/monster. Jim showed me a very impressive 10-minute short he had made called Xenogenesis. It was a futuristic sci-fi robot/laser battle done for about a nickel on his kitchen table using miniatures. Jim has said that he had Avatar in mind for many years and was waiting till the visual effects world caught up to his vision so he could make the film. It’s true. The short film I saw had a walking robot machine driven by a human inside it. It was the initial primitive model he had designed 25 years earlier which became the dazzling human-driven machine we all ogled in the finale battle of his unforgettable, jaw-dropping AVATAR wonder when it premiered around the world in December 2009. Jim liked the SHRIEK project, and was willing to leave Corman and come aboard as my production designer and visual effects specialist. He designed and built a very scary, hairy creature, complete with an expressive facial apparatus that was remote controlled. It was probably the most advanced and inventive creature ever built on the pennies we had. He even built the giant box to ship it to New Orleans. Cameron was incredibly resourceful and a very hard-working guy. His focused dedication to his work, even then, was mind-boggling. 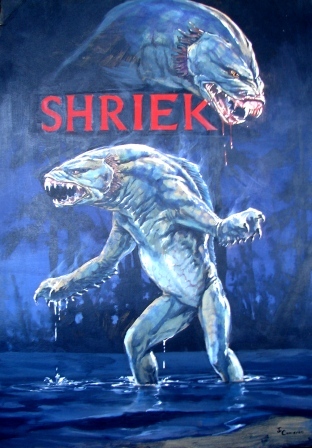 Photos: Conceptual design creature drawings by Jim Cameron for my first feature film SHRIEK. They are signed original paintings by Jim. At the time, I was living in Laurel Canyon with roommates, and we had thrown a kick-off party the Saturday before we were scheduled to leave for New Orleans. James showed up at the party looking bummed out. He told me he had bad news. He explained Roger Corman had found out he was leaving to design my film. Roger, known for his ability to spot talent, was not letting Jim go so easily. Roger promised to give Jim his first feature as a director if Jim continued working for him. Roger had correctly sensed Jim was a major talent. He fought to keep him. Jim felt bad letting me down, especially a week before we started shooting, but Roger was dangling a dream apple. Cameron had no choice; he really wanted to direct a film. Two days earlier, after months of working together, we had packed the Cameron monster in its custom case, and got it to the airport. Now, at our kickoff party, he was handing me the keys to the case. We hugged and wished each other well. I’m sure he later heard SHRIEK was never made. He obviously made the better choice by staying with Corman. Had I unknowingly come close to derailing or delaying James Cameron’s career had he left Roger to do my film? Would his career path have been altered? 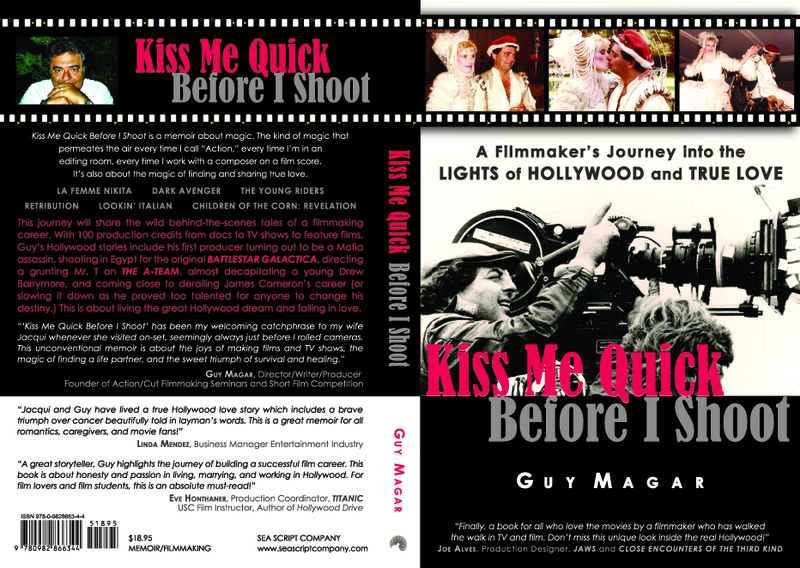 Destiny can be a strange, unpredictable force in Hollywood…ask anyone. Within a year, Roger kept his promise and gave Jim his first feature, the very low-budget Piranha Part Two: The Spawning. I had heard it was a miserable film for Jim to make, and he was locked out of the editing room. I’m sure he had his own producer battles; most powerless, young directors do on their first films. But I am also sure the directing experience must have helped Cameron secure the directing reins on Terminator. As they say, the rest is history. Jim was such a great talent, I’m sure he would have found a way to make his films with or without Roger. Nothing could have deterred him from his destiny to become one of our greatest filmmakers. As an old director friend who hired Jim early in his career, I am in awe of his amazing accomplishments and of the visual breath of his cinematic work. 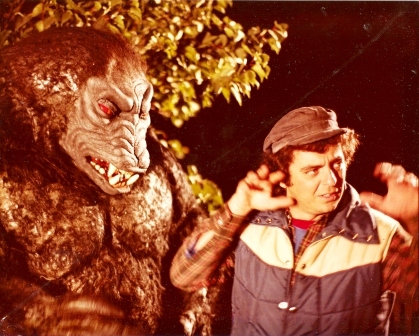 Photo: Me and the creature Jim Cameron built for my movie SHRIEK, which had servo-controlled facial features. Avatar is a mind-blowing wonder, a truly magical film experience in every sense. It is absolutely an industry game-changer, and has helped reignite the 3-D craze. Jim made both the first and the second biggest box-office, record-grossing movies in the history of cinema. I doubt any other director will ever match that in the history of mankind. Bravo, Jim. In my book, you are indeed the undisputed king of the film world! 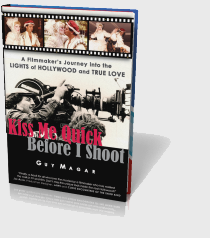 This entry was posted in Book Lovers, Celebrity in America, Entertainment News, Filmmaking, Great Film Directors, Hollywood Industry, Movie Magic, Uncategorized and tagged Avatar, James Cameron, Roger Corman, Terminator. Bookmark the permalink. 4 Responses to James Cameron’s SHRIEK before AVATAR! Amazing pix, great story. What a life you’ve lived, Guy! Thanks for sharing this incredible story. what a great story. It is amazing to me how talented people come together in this huge world and make wonderful things happen.